The St. Thomas More Society is a group of lawyers who meet quarterly at the Chapel during lunch for a talk and to discuss the ways in bringing Christ and the Church's Teachings to their courtrooms, juries, and classrooms. For more information, please contact the Chapel or subscribe to our e-newsletter for upcoming events. St. Thomas More was an English lawyer, social philosopher, and author. He was an important councellor to Henry VIII of England, but opposed the king's separation from the Catholic Church and refused to accept the king as Supreme Head of the Church of England. St. Thomas More was imprisoned in the Tower of London in 1534 for his refusal to take the oath required by the First Succession Act, because the act disparaged the power of the Pope and Henry’s marriage to Catherine of Aragon. In 1535, he was tried for treason and beheaded. Upon his death, St. Thomas More reaffirmed his love for the Catholic Church and the Papacy by stating "I am the King's good servant, but God's first." 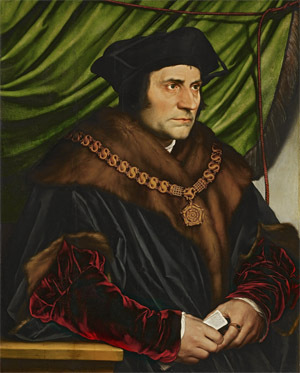 St. Thomas More was beatified in 1886 and canonized with St. John Fisher in 1935.